Prices have risen since Perak Hotel was named one of the world’s "best budget hotels" in 2001, but it retains much of its humble (small-room) charm. Ad Book now! Rates from US$92.26++. Average rating 7.5 from 863 reviews. Located in a restored white building with blue details in the middle of Little India, each of the 35 rooms has a different layout and has been lovingly decorated with Asian textiles and, in some cases, antiques. Rooms are air-con throughout and come with TV and mini-fridge. WiFi is available in the lobby and the restaurant area, though we were told it might work in some rooms. As with many Little India properties, noise, especially in the evening, can be an issue, but the second floor rooms with big windows are probably the better pick as they catch more natural light. Staff are very obliging and will gladly go out of their way to be helpful. There is also a sprawling attic suite that is ideal for families who don’t mind spending a bit more. 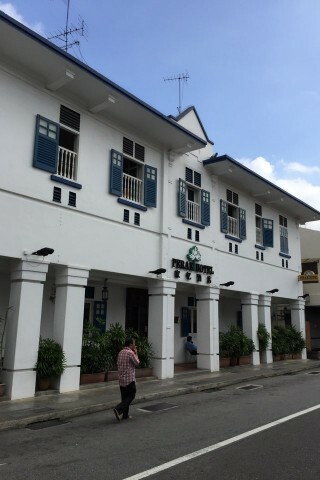 With the exception of the family room, the rooms at Perak Hotel are compact and the standard rooms cannot fit an extra bed. The closest SMRT station is Little India, about a five-minute walk away, and you’re also well positioned for the Tekka Centre and the myriad Indian restaurants on Serangoon Road. The Perak has far more character than the similarly priced Hotel 81 and other chains, but the rooms here are very compact. We were offered a standard for $110 net as a walk-in, a significant discount off the rates displayed on their website, so give them a call and also shop around online. Check rates at Perak Hotel on Booking.com.